The outdoor soft-sided kits are perfect for hiking,camping, marine adventures, home, and auto. 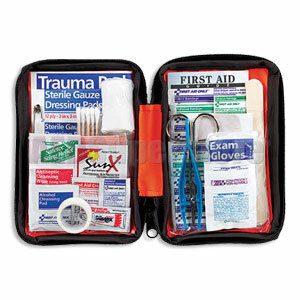 Includes all the essential first aid items for minor aches and injuries. Supplies are organized and easy to find in clear-pocket pages. This a small first aid kit that I plan to use for hiking and camping. If you put a small amount of insect repellent and your medications with the kit you've pretty much got whatever you might need for the normal cuts and scrapes that you may encounter and you should be able to cover most of your basic health needs away from home. Nice price considering the contents.